IIS 7.0 and later The features described in this article were introduced in IIS 7.0. IIS 6.0 and earlier The features described in this article were not supported prior to IIS 7.0. The IIS 7 and above Web server feature set is componentized into more than thirty independent modules. A module is either a Win32 DLL (native module) or a .NET 2.0 type contained within an assembly (managed module). Similar to a set of building blocks, modules are added to the server in order to provide the desired functionality for your applications. Likewise, all IIS modules can be removed, or replaced with custom modules developed using the IIS C++ APIs, or the familiar ASP.NET 2.0 APIs. 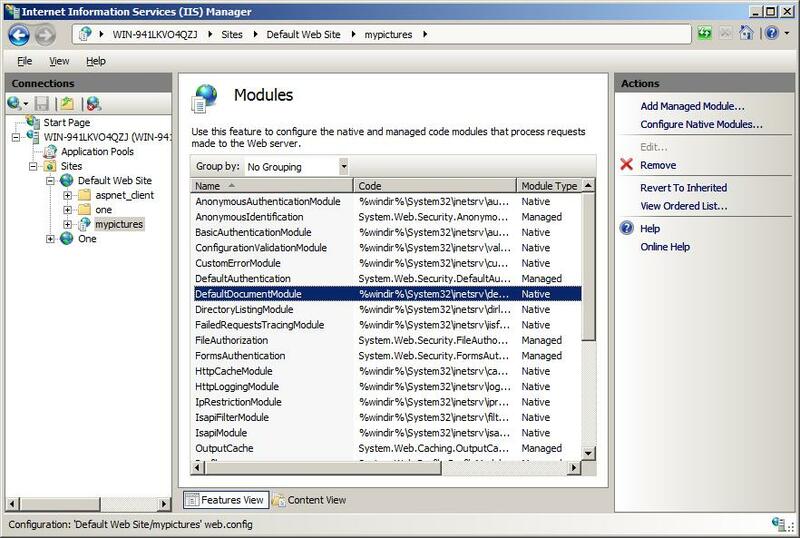 This article describes common IIS module management tasks, and details each module including its configuration settings and the potential effect a module removal has on the Web server. The management examples are given using both the graphical IIS Manager and the AppCmd command line tool. To follow the steps in this document it is best to do a full install of IIS. Not all editions of Windows support all available IIS features. To see which features of IIS are supported on your operating system, you will need to consult the documentation which shipped with your version of Windows. You can use the Web Platform Installer (Web PI) to easily install IIS, and applications that run on IIS. The Web PI is a free, lightweight tool that lets you install IIS and related technologies such as ASP.NET, SQL Server Express, Visual Web Developer, other popular Web applications, and more. Because the Web PI installs the latest versions of available Web Platform offerings, with just a few simple clicks you can download and install any new tools or updates. To learn more about the Web PI, see Learn more and install the Web PI. In the Control Panel, click Programs. In the Windows Features dialog, expand Internet Information Services and select all features. You may need to expand some categories to select all the features in that category. Open Server Manager > Roles and select Web Server (IIS). Check all features under Web Server. Install a module on the server (native modules only). Enable the module in an application. The first step registers the module globally with the server, making it available within each server worker process. It is necessary only for native modules due to the trusted nature of native code, and is available only to administrators. A native module has unrestricted access to any resource available to the server worker process, just like an ISAPI filter or extension in previous versions. Because of this unrestricted access, you should install only native modules that come from a trusted source. The second step enables the module to execute within a particular application and effectively allows the application administrator to control the server features enabled for the application. This step allows both installed native modules and managed modules to be enabled for each application. Manually editing the IIS configuration store. 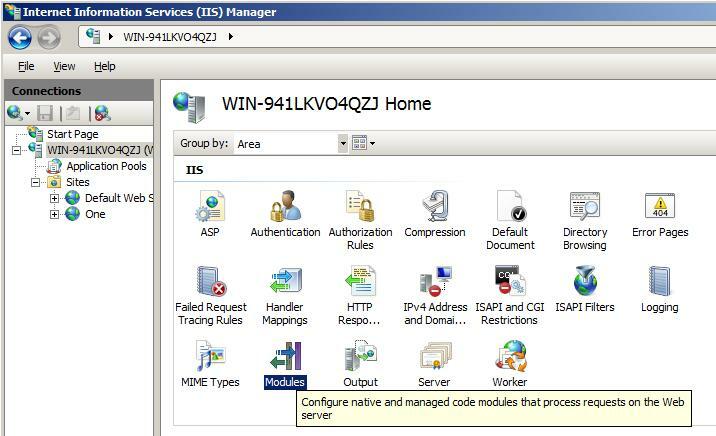 In IIS 7.5 and later you can use the Configuration Editor in the IIS Manager. All three of these options result in the module entry being added to the <globalModules> IIS configuration section, which can be set only at the server level. To examine the contents of this section, open the root configuration file located in %windir%\system32\inetsrv\config\applicationhost.config, and search for the string "<globalModules>". All of these modules are described in detail later in this document. Manually editing the IIS configuration store. In IIS 7.5 and above you can use the Configuration Editor. Because the <globalModules> configuration section can be set only at the server level, you must be an administrator to uninstall a module. A module must be enabled before it can provide service for a particular application. In order to enable a native module, it must first be installed on the server (see the previous section, To Install a Native Module). A managed module does not require installation, and can be enabled directly for each application. This allows applications to include their managed modules directly within the application by registering them in the application's web.config file, and providing the implementation in /BIN or /App_Code directories. Manually edit the IIS configuration store, either globally to enable the module for all applications on the server, or in a particular web.config file located within each application for which you would like to enable this module. In IIS 7.5 or above you can use the Configuration Editor. All three of these options add the module entry to the <modules> IIS configuration section, which is can be set at both the server level and application level. Examine the contents of this section by opening the root configuration file located in %windir%\system32\inetsrv\config\applicationhost.config, and searching for the string "<modules>". Unlike native modules, a managed module does not require adding an entry to the <globalModules> configuration section. Manually edit the <system.webServer>/<modules> configuration section in your application. Use the AppCmd.exe command line tool. After the module is removed from the application, it will not be active in that application. However, if the module is native, it will still be loaded in the server worker process, and may be used by other applications that did not remove it. The configuration section is unlocked by default if ASP.NET is installed. This default unlocking allows applications to disable both native and managed modules enabled globally, and to add new managed modules. This configuration section can be locked at the server level to prevent modification entirely, or prevent removal of specific module entries if desired by the Administrator. If you remove the attribute precondition="managedHandler", Forms Authentication also applies to content that is not served by managed handlers, such as .html, .jpg, .doc, but also for classic ASP (.asp) or PHP (.php) extensions. See "How to Take Advantage of IIS Integrated Pipeline" for an example of enabling ASP.NET modules to run for all content. When you use this property, the "managedHandler" precondition has no effect and all managed modules run for all requests. The IIS Manager provides an easy way to query, add or remove modules. To open the IIS Manager, click Start, type inetmgr in the Search box, and then press ENTER. Click the computer name of your IIS server. Click the Modules icon in the IIS category. Connect to that application using the tree view on the left. Navigate to the Modules feature pane. Click Add Managed Module to add a Managed Module to your application. Add Native Module only allows you to add a module that is already registered on the Server level. Click the module in the list. The Remove task displays in the left pane. To quickly manage modules from the command line, or script module management tasks, use the AppCmd.exe command line tool. At the Command Prompt, type the following command, replacing values in italics with the values for the module on your computer. Installing a native module automatically enables it at the server level. For example, the following command installs the Default Document module. Uninstalling a module automatically disables it at the server level. For example, the following command uninstalls the Default Document module. This command is provided only as example. You should only run it on a test server. At the Command Prompt, type the following command, replacing values in italic text with the values for the module on your computer. For example, the following command lists the modules enabled for the Default Web Site. %windir%\system32\inetsrv\appcmd.exe list modules /app.name:"Default Web Site"
And this command lists the modules installed globally. For example, the following command adds the Forms Authentication module to the Default Web Site. %windir%\system32\inetsrv\appcmd.exe add module /name:FormsAuthentication /type:System.Web.Security.FormsAuthenticationModule /app.name:"Default Web Site"
And this command adds the Forms Authentication Module globally. For example, the following command removes the Forms Authentication module from the Default Web Site. %windir%\system32\inetsrv\appcmd.exe delete module FormsAuthentication /app.name:"Default Web Site"
And this command removes the Forms Authentication Module globally. Appcmd.exe install module /?Appcmd add module /? The IIS server is ready for customizing. Read the following list carefully to avoid side-effects, feature loss or removing security features. These modules do not provide request services, but instead assist the server engine with its internal operation. Description: Implements a generic cache for URL-specific server state, such as configuration. With this module, the server only reads configuration for the first request for a particular URL, and reuse it on subsequent requests until it changes. Potential issues when removing this module Performance loss due to state cached for each URL retrieval for every request. Description: Caches file handles for files opened by the server engine and modules. Potential issues when removing this module Performance loss. If file handles are not cached, the files have to be opened for every request. Description: Caches windows security tokens for password based authentication schemes (anonymous authentication, basic authentication, IIS client certificate authentication). Potential issues when removing this module Performance loss. The users must be logged on for every request if the token is not cached. A major performance impact may result. For example, if a password protected html page references 50 images that are also protected, 51 logonUser calls to the local account database, or worse, to an off-box domain controller, result in a performance issue. Description: Managed Engine has a special place within all the other modules. It is responsible for providing the IIS integration to hook up with the ASP.NET runtime. Potential issues when removing this module ASP.NET integration will be disabled. None of the managed modules declared in the <modules> or ASP.NET handlers declared in the <handlers> section are called when the Application Pool runs in Integrated Mode. Description: The HttpCacheModule implements the IIS output cache and also the logic for caching items in the http.sys cache. Set the cache size, output cache profiles etc. via configuration. Potential issues when removing this module Content will no longer be cached in kernel mode. Cache profiles are ignored. Removing the HttpCacheModule will probably have adverse effects on performance and resource usage. Description: Implements in-memory compression of dynamic content. Configuration sections: system.webServer/httpCompression and system.webServer/urlCompression. Dependencies: There will not be any dependencies because Dynamic compression is turned off by default. Description: Implements compression (in memory as well as persistent in the file system) of static content. Potential issues when removing this module Potential Bandwidth saturation due to uncompressed content being sent back to the client. Description: Implements default document functionality. Requests that come in with a trailing / will be rerouted to a document in the default document list. Potential issues when removing this module Requests to /, for example http://localhost/, return a 404 error. If a directoryBrowsing is enabled, a directory listing is generated. Description: Implements directory browsing functionality. Potential issues when removing this module If the neither the default document module nor the directoryListing Module handle a request for a /, an empty response returns. Description: Implements custom and redirect response headers. Implements the trace and Options HTTP verbs. Implements the supports which allow or turn off keep-alive support via configuration. Potential issues when removing this module TRACE or OPTIONS requests return a "405 Method not allowed" error message. Potential issues when removing this module Potential security issue if resources were protected by redirection. When the Redirection module is removed, the content becomes accessible again. Description: Implements server side includes. This module is mapped as a handler, only executing for requests ending in .stm, .shtm and .shtml. Potential issues when removing this module The static file module handles.stm, .shtm and .shtml files. If this module has a mimeMap for these extensions the files become served as text. Note, however, that this is not the default. Description: Sends out static files with the file extension .html, .jpg, as well as many others. The staticContent/mimeMap configuration collection determines the list of file extensions. Potential issues when removing this module Static files no longer become served. Requests for files return a 404 Not Found error indicating that no handler was matched. Description: Implements anonymous authentication. This module generates the HttpUser object if a URL is configured to allow anonymous authentication. Potential issues when removing this module At least one authentication module must be configured. The IIS server core checks after the authentication phase if the HttpUser object is populated. The HttpUser object is an IIS data structure. A 401.2 error generates if there is no authentication populating the HttpUser object. Description: Maps SSL client certificates to an Active Directory account (Active Directory Certificate Mapping). Dependencies: SSL must be configured for this module to work. The IIS machine must also be a member of an Active Directory domain. Potential issues when removing this module Requests are normally allowed if Active Directory Certificate Mapping is used to protect a directory; in this case, the module is removed. Description: implements HTTP Basic authentication described in RFC 2617. Potential issues when removing this module At least one authentication module has must be configured. The IIS server core checks after the authentication phase if the HttpUser object is populated. The HttpUser object is an IIS data structure. A 401.2 error generates if there is no authentication populating the HttpUser object. Description: Implements Windows authentication (NTLM or Negotiate (Kerberos)). Potential issues when removing this module At least one authentication module must be configured. The IIS server core checks after the authentication phase if the HttpUser object is populated. The HttpUser object is an IIS data structure. A 401.2 error is generates if there is no authentication populating the HttpUser object. Description: Implements digest authentication described in RFC 2617. Dependencies: IIS server must be part of an Active Directory domain. Dependencies: SSL with the requirement to receive client certificates has to be configured for this module to work. Description: Implements authorization based on configuration rules. Potential issues when removing this module Authorization rules which protected content are no longer evaluated. Content that was supposed to be protected might be served. Description: Implements ISAPI Extension functionality. Potential issues when removing this module ISAPI Extensions mapped in the <handlers> section (modules="IsapiModule") or explicitly called ISAPI Extensions will no longer work. Description: Implements ISAPI filter functionality. Potential issues when removing this module ISAPI filters often implement functionality applications rely on. Examples are ASP.NET or SharePoint. ASP.NET for example needs the aspnet_filter.dll to protect sensitive content and to rewrite URLs. Removing this module prevents IIS from loading ISAPI filters. Applications might stop working or sensitive content may be exposed. Description: Implements an authorization scheme based on the IPv4 address of the client request. Dependencies: IPv4 stack must be installed. Potential issues when removing this module Clients with IP addresses on the ipSecurity list will be allowed. Description: Implements a powerful set of security rules which reject suspicious request at a very early stage. This module is the successor to the ISAPI filter UrlScan.DLL that was shipped for IIS 5.0 and 6.0. Potential issues when removing this module If this module is removed, the rules specified in the requestFiltering section no longer apply. Potential security issues may result. Description: Implements the ILogPlugin interface on top of IIS. ILogPlugin is a previous COM implementation that allowed customers to extend IIS logging. We do not recommend extending IIS using this interface. Instead, customers should write a module and subscribe to the RQ_LOG_REQUEST notification. Potential issues when removing this module A custom log plug-in will no longer be called. For example, ODBC Logging is implemented as ILogPlugin. Description: Implements custom errors and the IIS detailed error feature. Potential issues when removing this module IIS returns blank pages with minimal information when errors within the core server occur. Remote users may see detailed error information coming from server components which can result in disclosing information. Description: Implements standard IIS logging by telling HTTP.SYS what to log. Potential issues when removing this module Standard IIS logging will no longer work. Description: Implements tracing of failed requests. Define and set rules for failed requests via configuration. Potential issues when removing this module Tracing http requests will no longer work. Description: Implements the IIS Run-time State and Control Interface (RSCA). RSCA allows users to query for run-time information such as currently executing request, start/stop state of a web-site, or currently executing application domains. Potential issues when removing this module Tools will be unable to enumerate currently executing requests. Description: Implements CGI on top of IIS. Potential issues when removing this module CGI programs will stop working. Potential issues when removing this module ETW tracing will not work if this module is removed. Description: Validates that ASP.NET application configuration has been migrated to work in Integrated mode. Potential issues when removing this module Applications that specify legacy ASP.NET configuration for modules and handlers will not generate migration errors; a new application that has not been migrated will function incorrectly. Description: Implements the ASP.NET Output Caching feature. Dependencies: ManagedEngine module has to be installed. Potential issues when removing this module ASP.NET will be unable to output cache responses to pages configured to be output cached. Potential issues when removing this module Managed session state is not available. Description: See ASP.NET 2.0 documentation for details. Potential issues when removing this module WindowsAuthentication.OnAuthenticate event will not be raised, which may prevent some custom ASP.NET authentication code from running. Also, the authenticated user will not be replaced with the UNC user when on UNC share (legacy ASP.NET behavior). This module does not affect NTLM/Kerberos authentication for ASP.NET applications in Integrated mode, and is not required outside of the WindowsAuthentication.OnAuthenticate event and the legacy UNC behavior. Potential issues when removing this module ASP.NET forms-based authentication feature will not be available, resulting in clients with forms authentication tickets not being able to access protected resources. Potential issues when removing this module Some ASP.NET features may not work for anonymous requests if ASP.NET authentication mode is Forms. Also, DefaultAuthentication.OnAuthenticate event will not be raised. Dependencies: ManagedEngine module must be installed. Potential issues when removing this module Role Manager functionality not available. Description: See ASP.NET 2.0 documentation for details. The native UrlAuthorization module implements URL authorization functionality in native code. This provides a scalable and fast native alternative for the managed URL authorization module. Potential issues when removing this module ASP.NET authorization rules will be ignored, possibly resulting in information disclosure and other security compromises. Potential issues when removing this module The anonymous identification feature used by the ASP.NET Profile will not work. Potential issues when removing this module The ASP.NET Profile feature will not work. Potential issues when removing this module The ASP.NET URL mappings will not work.